You can also put a griddle plate on the grates to cook pancakes and eggs or what ever else you would normally use a griddle for. Another use would be to heat pans or even just keep pans warm, and you can adjust the grill on high or low dependent on what’s cooking. In the cooking school we have found this is probably the most versatile area on the stove. 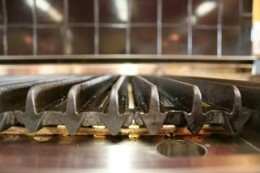 • 1.Reduce the grease hitting the burner (reducing smoke and flare-ups). • 2.Make clean up much easier. The grates come in two sections. To clean, simply treat them the same as any outdoor grill grates, scrub them with a wire brush to remove all excess charred food. Occasionally, if you have a will to, you can treat them with a little oil, but I don't really think it’s necessary due to the amount of grease that runs over the grates during use. The purpose of the stainless steel encased ceramic rods is to spread evenly the heat from left to right. 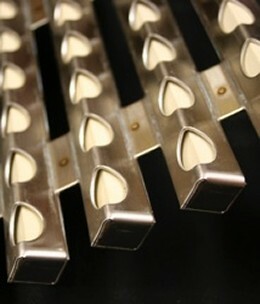 When the heat from the burner rises, it hits the center sections of the ceramic rods. 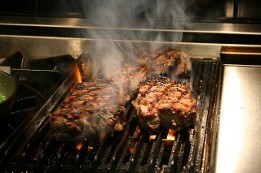 Then the heat is transferred to the rods which heats much more evenly. The Capital Culinarian Series griddle has a really nice temperature span, from 150 - 550 degrees. You can clearly cook on it, but you can also set it for 150 degrees and use it as a warming plate a very useful addition to a range top. The way to get the most from the griddle is to see it as an open ended stainless steel skillet. What ever you can do in a skillet that won’t run out of the open end, you can also do on the griddle. Think of the griddle in this way and you will get much more use from what is a great versatile cooking surface. TOP TIP....Don’t use the stainless steel grill / griddle covers as a resting place they will scratch. You will also see in the picture that the cooking surface stops short of the front of the range. 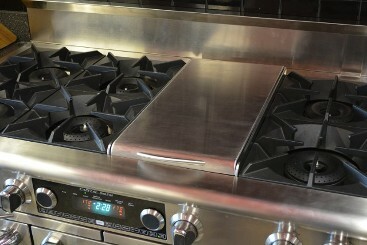 The area to the front of the range is where you will pull the grease and waste during cooking and cleaning. The hole in the waste tray empties directly down to the drip tray, which lined with tin foil / aluminum foil, makes for easy cleaning. • 2.Clean this area with an absorbent paper towel. 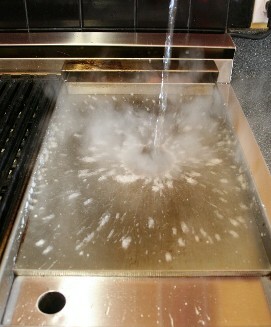 The griddle plate itself is 3/8” thick solid steel, heated from underneath by an 18,000 Btu gas burner. Remember, you have the ability to set the temperature range from 150 F- 550 F degrees. To the rear of the griddle plate you will see the rear vent, which allows excess heat from underneath the griddle to escape. 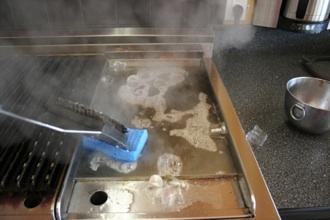 Cleaning the griddle after use is pretty easy, simply scrape the left over grease and burnt food from the back to the front with a pastry scraper, then throw some ice on the unit. This will create a steam clean. While the ice and water is jumping around, use the rough side of a sponge to scrub the burnt food away, held by a long implement (e.g. a tong, grill brush, etc.). Keep the water on the griddle until it has evaporated. Use a grill brush as you can see in the picture. This helps me put leverage onto the sponge and keeps my hand away from the steam.